In 2013, the movement began with the use of the hashtag #BlackLivesMatter on social media after the acquittal of George Zimmerman in the shooting death of African-American teen Trayvon Martin in February 2012. Black Lives Matter became nationally recognized for its street demonstrations following the 2014 deaths of two African Americans: Michael Brown—resulting in protests and unrest in Ferguson—and Eric Garner in New York City. Since the Ferguson protests, participants in the movement have demonstrated against the deaths of numerous other African Americans by police actions or while in police custody. In the summer of 2015, Black Lives Matter activists became involved in the 2016 United States presidential election. The originators of the hashtag and call to action, Alicia Garza, Patrisse Cullors, and Opal Tometi, expanded their project into a national network of over 30 local chapters between 2014 and 2016. The overall Black Lives Matter movement, however, is a decentralized network and has no formal hierarchy. There have been many reactions to the Black Lives Matter movement. The U.S. population's perception of Black Lives Matter varies considerably by race. The phrase "All Lives Matter" sprang up as a response to the Black Lives Matter movement, but has been criticized for dismissing or misunderstanding the message of "Black Lives Matter". Following the shooting of two police officers in Ferguson, the hashtag Blue Lives Matter was created by supporters of the police. Some black civil rights leaders have disagreed with tactics used by Black Lives Matter activists. BLM claims inspiration from the civil rights movement, the Black Power movement, the 1980s Black feminist movement, Pan-Africanism, the Anti-Apartheid Movement, hip hop, LGBTQ social movements, and Occupy Wall Street. Several media organizations have referred to BLM as "a new civil rights movement." Some of the protesters, however, actively distinguish themselves from the older generation of black leadership, such as Al Sharpton, by their aversion to middle-class traditions such as church involvement, Democratic Party loyalty, and respectability politics. Political scientist Frederick C. Harris has argued that this "group-centered model of leadership" is distinct from the older charismatic leadership model that characterized civil rights organizations like Jesse Jackson's Rainbow PUSH Coalition and Sharpton's National Action Network. In the summer of 2013, after George Zimmerman's acquittal for the shooting death of Trayvon Martin, the movement began with the hashtag #BlackLivesMatter. The movement was co-founded by three black community organizers: Alicia Garza, Patrisse Cullors, and Opal Tometi. Garza, Cullors and Tometi met through "Black Organizing for Leadership & Dignity" (BOLD), a national organization that trains community organizers. They began to question how they were going to respond to what they saw as the devaluation of black lives after Zimmerman's acquittal. Garza wrote a Facebook post titled "A Love Note to Black People" in which she said: "Our Lives Matter, Black Lives Matter". Cullors replied: "#BlackLivesMatter". Tometi then added her support, and Black Lives Matter was born as an online campaign. In August 2014, BLM members organized their first in-person national protest in the form of a "Black Lives Matter Freedom Ride" to Ferguson, Missouri after the shooting of Michael Brown. More than five hundred members descended upon Ferguson to participate in non-violent demonstrations. Of the many groups that descended on Ferguson, Black Lives Matter emerged from Ferguson as one of the best organized and most visible groups, becoming nationally recognized as symbolic of the emerging movement. The activities in the streets of Ferguson caught the attention of a number of Palestinians who tweeted advice on how to deal with tear gas. This connection helped to bring to Black activists' attention the ties between the Israeli armed forces and police in the United States, and would later influence the Israel section of the platform of the Movement for Black Lives, released in 2016. Since then, Black Lives Matter has organized thousands of protests and demonstrations. Expanding beyond street protests, BLM has expanded to activism on American college campuses, such as the 2015–16 University of Missouri protests. Black Lives Matter incorporates those traditionally on the margins of black freedom movements. The organization's website, for instance, states that Black Lives Matter is "a unique contribution that goes beyond extrajudicial killings of Black people by police and vigilantes" and, embracing intersectionality, that "Black Lives Matter affirms the lives of Black queer and trans folks, disabled folks, black-undocumented folks, folks with records, women, and all Black lives along the gender spectrum." All three founders of the Black Lives Matter movement are women, and Garza and Cullors identify as queer. Additionally, Elle Hearns, one of the founding organizers of the global network, is a transgender woman. The founders believe that their backgrounds have paved the way for Black Lives Matter to be an intersectional movement. Several hashtags such as #BlackWomenMatter, #BlackGirlsMatter, #BlackQueerLivesMatter, and #BlackTransLivesMatter have surfaced on the BLM website and throughout social media networks. Marcia Chatelain, associate professor of history at Georgetown University, has praised BLM for allowing "young, queer women [to] play a central role" in the movement. Black Lives Matter supporters and allies gather inside the Minneapolis City Hall rotunda on December 3, 2015, after an early morning raid and eviction of demonstrators occupying the space outside the Minneapolis Police Department's 4th Precinct, following the police shooting death of Jamar Clark. The phrase "Black Lives Matter" can refer to a Twitter hashtag, a slogan, a social movement, or a loose confederation of groups advocating for racial justice. As a movement, Black Lives Matter is decentralized, and leaders have emphasized the importance of local organizing over national leadership. Activist DeRay McKesson has commented that the movement "encompasses all who publicly declare that black lives matter and devote their time and energy accordingly." In 2013, Patrisse Cullors, Alicia Garza, and Opal Tometi formed the Black Lives Matter Network. Alicia Garza described the network as an online platform that existed to provide activists with a shared set of principles and goals. Local Black Lives Matter chapters are asked to commit to the organization's list of guiding principles, but operate without a central structure or hierarchy. Alicia Garza has commented that the Network was not interested in "policing who is and who is not part of the movement." Currently, there are at least 30 Black Lives Matter chapters in the U.S., England, Canada, Australia, and Ghana. Notable Black Lives Matter activists include co-founder of the Seattle Black Lives Matter chapter Marissa Johnson, lawyer and president of the Minneapolis chapter of the NAACP Nekima Levy-Pounds, and writer Shaun King. In a September 2016 interview with W. Kamau Bell and Hari Kondabolu, King described himself as part of the broader Black Lives Matter movement and supportive of the formal organization Black Lives Matter, but not affiliated with the latter. The loose structure of Black Lives Matter has contributed to confusion in the press and among activists, as actions or statements from chapters or individuals are sometimes attributed to "Black Lives Matter" as a whole. Matt Pearce, writing for the Los Angeles Times, commented that "the words could be serving as a political rallying cry or referring to the activist organization. Or it could be the fuzzily applied label used to describe a wide range of protests and conversations focused on racial inequality." According to the Black Lives Matter website, there are thirteen guiding principles that should apply to those who choose to become involved under the Black Lives Matter banner, among them Diversity, Globalism, Empathy, Restorative justice and Intergenerationality. Concurrently, a broader movement involving several other organizations and activists emerged under the banner of "Black Lives Matter" as well. For example, BLM is a member organization of the Movement for Black Lives established to respond to sustained and increasingly visible violence against black communities in the U.S. and globally. In 2015 Johnetta Elzie, DeRay Mckesson, Brittany Packnett, and Samuel Sinyangwe, initiated Campaign Zero, aimed at promoting policy reforms to end police brutality. The campaign released a ten-point plan for reforms to policing, with recommendations including: ending broken windows policing, increasing community oversight of police departments, and creating stricter guidelines for the use of force. New York Times reporter John Eligon reported that some activists had expressed concerns that the campaign was overly focused on legislative remedies for police violence. Black Lives Matter originally used social media—including hashtag activism—to reach thousands of people rapidly. Since then, Black Lives Matters has embraced a diversity of tactics. In 2014, the American Dialect Society chose #BlackLivesMatter as their word of the year. Yes! Magazine picked #BlackLivesMatter as one of the twelve hashtags that changed the world in 2014. Memes are also important in garnering support for the Black Lives Matter new social movement. Information communication technologies such as Facebook and Twitter spread memes and are important tools for garnering web support in hopes of producing a spillover effect into the offline world. However, Blue Lives Matter and other opponents of BLM have also used memes to criticize and parody the movement. As of September 2016, the phrase "Black Lives Matter" has been tweeted over 30 million times, and Black Twitter has been credited with bringing international attention to the BLM movement. Using the hashtag #BlackLivesMatter has helped activists communicate the scale of their movement to the wider online community and stand in solidarity amongst other participants. Dr. Khadijah White, a professor at Rutgers University, argues that BLM has ushered in a new era of black university student movements. The ease with which bystanders can record graphic videos of police violence and post them onto social media has driven activism all over the world. BLM generally engages in direct action tactics that make people uncomfortable enough that they must address the issue. BLM has been known to build power through protest and rallies. BLM has also staged die-ins and held one during the 2015 Twin Cities Marathon. Political slogans used during demonstrations include the eponymous "Black Lives Matter", "Hands up, don't shoot" (a later discredited reference attributed to Michael Brown), "I can't breathe" (referring to Eric Garner), "White silence is violence", "No justice, no peace", and "Is my son next? ", among others. According to a 2018 study, "Black Lives Matter protests are more likely to occur in localities where more Black people have previously been killed by police." Songs such as Kendrick Lamar's "Alright" have been used as a rallying call at demonstrations. The short documentary film Bars4justice features brief appearances by various activists and recording artists affiliated with the Black Lives Matter movement. The film is an official selection of the 24th Annual Pan African Film Festival. Stay Woke: The Black Lives Matter Movement is a 2016 American television documentary film starring Jesse Williams about the Black Lives Matter movement. 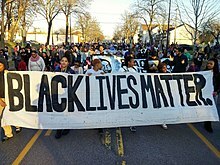 In 2014, Black Lives Matter demonstrated against the deaths of numerous African Americans by police actions, including those of Dontre Hamilton, Eric Garner, John Crawford III, Michael Brown, Ezell Ford, Laquan McDonald, Akai Gurley, Tamir Rice, Antonio Martin, and Jerame Reid, among others. In July, Eric Garner died in New York City, after a New York City Police Department officer put him in a chokehold while arresting him. Garner's death has been cited as one of several police killings of African Americans that sparked the Black Lives Matter movement. In August, during Labor Day weekend, Black Lives Matter organized a "Freedom Ride", that brought more than 500 African-Americans from across the United States into Ferguson, Missouri, to support the work being done on the ground by local organizations. The movement continued to be involved in the Ferguson unrest, following the death of Michael Brown. Also in August, Los Angeles Police Department officers shot and killed Ezell Ford. Following the shooting, BLM protested his death in Los Angeles into 2015. In November, a New York City Police Department officer shot and killed, Akai Gurley, a 28-year-old African-American man. Gurley's death was later protested by Black Lives Matter in New York City. In Oakland, California, fourteen Black Lives Matter activists were arrested after they stopped a Bay Area Rapid Transit (BART) train for more than an hour on Black Friday, one of the biggest shopping days of the year. The protest, led by Black Lives Matter co-founder Alicia Garza, was organized in response to the grand jury decision not to indict Darren Wilson for the death of Mike Brown. Also in November, Tamir Rice, a 12-year-old African-American boy was shot and killed by a Cleveland police officer. Rice's death has also been cited as "sparking" the Black Lives Matter movement. 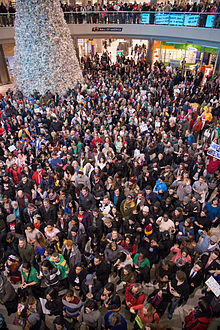 In December, 2,000–3,000 people gathered at the Mall of America in Bloomington, Minnesota, to protest the killings of unarmed black men by police. At least twenty members of a protest that had been using the slogan were arrested. In Milwaukee, Wisconsin, BLM protested the police shooting of Dontre Hamilton, who died in April. Black Lives Matter protested the shooting of John Crawford III. The shooting of Renisha McBride was protested by Black Lives Matter. Also in December, in response to the decision by the grand jury not to indict Darren Wilson on any charges related to the death of Michael Brown, a protest march was held in Berkeley, California. Later, in 2015, protesters and journalists who participated in that rally filed a lawsuit alleging "unconstitutional police attacks" on attendees. In 2015, Black Lives Matter demonstrated against the deaths of numerous African Americans by police actions, including those of Charley Leundeu Keunang, Tony Robinson, Anthony Hill, Meagan Hockaday, Eric Harris, Walter Scott, Freddie Gray, William Chapman, Jonathan Sanders, Sandra Bland, Samuel DuBose, Jeremy McDole, Corey Jones, and Jamar Clark as well as the killing of The Charleston Nine. In March, BLM protested at Chicago Mayor Rahm Emanuel's office, demanding reforms within the Chicago Police Department. Charley Leundeu Keunang, a 43-year-old Cameroonian national, was fatally shot by Los Angeles Police Department officers. The LAPD arrested fourteen following BLM demonstrations. In April, Black Lives Matter across the United States protested over the death of Freddie Gray which included the 2015 Baltimore protests. After the shooting of Walter Scott in North Charleston, South Carolina, Black Lives Matter protested Scott's death and called for citizen oversight of police. In May, a protest by BLM in San Francisco was part of a nationwide protest, Say Her Name, decrying the police killing of black women and girls, which included the deaths of Meagan Hockaday, Aiyana Jones, Rekia Boyd, and others. In Cleveland, Ohio, after an officer was acquitted at trial in the shooting of Timothy Russell and Malissa Williams, BLM protested. In Madison, Wisconsin, BLM protested after the officer was not charged in the shooting of Tony Robinson. In June, after Dylann Roof's shooting in a historically black church in Charleston, South Carolina, BLM issued a statement and condemned the shooting as an act of terror. BLM across the country marched, protested and held vigil for several days after the shooting. BLM was part of a march for peace on the Arthur Ravenel Jr. Bridge in South Carolina. After the Charleston shooting, a number of memorials to the Confederate States of America were graffitied with "Black Lives Matter" or otherwise vandalized. Around 800 people protested in McKinney, Texas after a video was released showing an officer pinning a girl—at a pool party in McKinney, Texas—to the ground with his knees. In July, BLM activists across the United States began protests over the death of Sandra Bland, an African-American woman, who was allegedly found hanged in a jail cell in Waller County, Texas. In Cincinnati, Ohio, BLM rallied and protested the death of Samuel DuBose after he was shot and killed by a University of Cincinnati police officer. In Newark, New Jersey, over a thousand BLM activists marched against police brutality, racial injustice, and economic inequality. Also in July, BLM protested the death of Jonathan Sanders who died while being arrested by police in Mississippi. In August, BLM organizers held a rally in Washington, D.C., calling for a stop to violence against transgender women. In Charlotte, North Carolina, after a judge declared a mistrial in the trial of a white Charlotte police officer who killed an unarmed black man, Jonathan Ferrell, BLM protested and staged die-ins. In Philadelphia, Pennsylvania, Janelle Monáe, Jidenna, and other BLM activists marched through North Philadelphia to bring awareness to police brutality and Black Lives Matter. Around August 9, the first anniversary of Michael Brown's death, BLM rallied, held vigil and marched in St. Louis and across the country. In September, over five hundred BLM protesters in Austin, Texas rallied against police brutality, and several briefly carried protest banners onto Interstate 35. In Baltimore, Maryland, BLM activists marched and protested as hearings began in the Freddie Gray police brutality case. In Sacramento, California, about eight hundred BLM protesters rallied to support a California Senate bill that would increase police oversight. BLM protested the shooting of Jeremy McDole. In October, Black Lives Matters activists were arrested during a protest of a police chiefs conference in Chicago. "Rise Up October" straddled the Black Lives Matter Campaign, and brought several protests. Quentin Tarantino and Cornel West, participating in "Rise Up October", decried police violence. An activist holds a "Black Lives Matter" sign outside the Minneapolis Police Fourth Precinct building following the officer-involved shooting of Jamar Clark on November 15, 2015. In November, BLM activists protested after Jamar Clark was shot by Minneapolis Police Department. A continuous protest was organized at the Minneapolis 4th Precinct Police. During the encamped protest, protestors, and outside agitators clashed with police, vandalized the station and attempted to ram the station with an SUV. Later that month a march was organized to honor Jamar Clark, from the 4th Precinct to downtown Minneapolis. After the march, a group of men carrying firearms and body armor appeared and began calling the protesters racial slurs according to a spokesperson for Black Lives Matter. After protesters asked the armed men to leave, the men opened fire, shooting five protesters. All injuries required hospitalization, but were not life-threatening. The men fled the scene only to be found later and arrested. The three men arrested were young and white, and observers called them white supremacists. In February 2017, one of the men arrested, Allen Scarsella, was convicted of a dozen felony counts of assault and riot in connection with the shooting. Based in part on months of racist messages Scarsella had sent his friends before the shooting, the judge rejected arguments by his defense that Scarsella was "naïve" and sentenced him in April 2017 to 15 years out of a maximum 20-year sentence. From November into 2016, BLM protested the shooting death of Laquan McDonald, calling for the resignation of numerous Chicago officials in the wake of the shooting and its handling. McDonald was shot 16 times by Chicago Police Officer Jason Van Dyke. In 2016, Black Lives Matter demonstrated against the deaths of numerous African Americans by police actions, including those of Bruce Kelley Jr., Alton Sterling, Philando Castile, Joseph Mann, Abdirahman Abdi, Paul O'Neal, Korryn Gaines, Sylville Smith, Terence Crutcher, Keith Lamont Scott, Alfred Olango, and Deborah Danner, among others. In January, hundreds of BLM protesters marched in San Francisco to protest the December 2, 2015, shooting death of Mario Woods, who was shot by San Francisco Police officers. The march was held during a Super Bowl event. BLM held protests, community meetings, teach-ins, and direct actions across the country with the goal of "reclaim[ing] the radical legacy of Martin Luther King Jr."
In February, Abdullahi Omar Mohamed, a 17-year-old Somali refugee, was shot and injured by Salt Lake City, Utah, police after allegedly being involved in a confrontation with another person. The shooting led to BLM protests. In June, members of BLM and Color of Change protested the California conviction and sentencing of Jasmine Richards for a 2015 incident in which she attempted to stop a police officer from arresting another woman. Richards was convicted of "attempting to unlawfully take a person from the lawful custody of a peace officer", a charge that the state penal code had designated as "lynching" until that word was removed two months prior to the incident. On July 5, Alton Sterling, a 37-year-old black man, was shot several times at point-blank range while pinned to the ground by two white Baton Rouge Police Department officers in Baton Rouge, Louisiana. On the night of July 5, more than 100 demonstrators in Baton Rouge shouted "no justice, no peace," set off fireworks, and blocked an intersection to protest Sterling's death. On July 6, Black Lives Matter held a candlelight vigil in Baton Rouge, with chants of "We love Baton Rouge" and calls for justice. 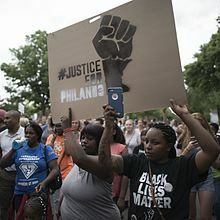 On July 6, Philando Castile was fatally shot by Jeronimo Yanez, a St. Anthony, Minnesota police officer, after being pulled over in Falcon Heights, a suburb of St. Paul. Castile was driving a car with his girlfriend and her 4-year-old daughter as passengers when he was pulled over by Yanez and another officer. According to his girlfriend, after being asked for his license and registration, Castile told the officer he was licensed to carry a weapon and had one in the car. She stated: "The officer said don't move. As he was putting his hands back up, the officer shot him in the arm four or five times." She live-streamed a video on Facebook in the immediate aftermath of the shooting. Following the fatal shooting of Castile, BLM protested throughout Minnesota and the United States. On July 7, a BLM protest was held in Dallas, Texas that was organized to protest the deaths of Alton Sterling and Philando Castile. At the end of the peaceful protest, Micah Xavier Johnson opened fire in an ambush, killing five police officers and wounding seven others and two civilians. The gunman was then killed by a robot-delivered bomb. Before he died, according to police, Johnson said that "he was upset about Black Lives Matter", and that "he wanted to kill white people, especially white officers." Texas Lt. Governor Dan Patrick and other conservative lawmakers blamed the shootings on the Black Lives Matter movement. The Black Lives Matter network released a statement denouncing the shootings. On July 8, more than 100 people were arrested at Black Lives Matter protests across the United States. In the first half of July, there were at least 112 protests in 88 American cities. In July 2016, NBA stars LeBron James, Carmelo Anthony, Chris Paul, and Dwyane Wade opened the 2016 ESPY Awards with a Black Lives Matter message. On July 26, Black Lives Matter held a protest in Austin, Texas, to mark the third anniversary of the shooting death of Larry Jackson Jr. On July 28, Chicago Police Department officers shot Paul O'Neal in the back and killed him following a car chase. After the shooting, hundred marched in Chicago, Illinois. In Randallstown, Maryland, near Baltimore, on August 1, 2016, police officers shot and killed Korryn Gaines, a 23-year-old African-American woman, also shooting and injuring her son. Gaines' death was protested throughout the country. In August, in Pittsburgh, Pennsylvania, Black Lives Matter protested the death of Bruce Kelley Jr. who was shot after fatally stabbing a police dog while trying to escape from police the previous January. Beginning in August, several professional athletes have participated in the 2016 U.S. national anthem protests. The protests began in the National Football League (NFL) after Colin Kaepernick of the San Francisco 49ers sat during the anthem, as opposed to the tradition of standing, before his team's third preseason game of 2016. During a post-game interview he explained his position stating, "I am not going to stand up to show pride in a flag for a country that oppresses black people and people of color. To me, this is bigger than football and it would be selfish on my part to look the other way. There are bodies in the street and people getting paid leave and getting away with murder," a protest widely interpreted as in solidarity with the Black Lives Matter movement. The protests have generated mixed reactions, and have since spread to other U.S. sports leagues. In September 2016, BLM protested the shooting deaths by police officers of Terence Crutcher in Tulsa, Oklahoma, and Keith Lamont Scott in Charlotte, North Carolina. The Charlotte Observer reported "The protesters began to gather as night fell, hours after the shooting. They held signs that said 'Stop Killing Us' and 'Black Lives Matter,' and they chanted 'No justice, no peace.' The scene was sometimes chaotic and tense, with water bottles and stones chucked at police lines, but many protesters called for peace and implored their fellow demonstrators not to act violently." Multiple nights of protests from September to October 2016 were held in El Cajon, California, following the shooting of Alfred Olango. In 2017, in Black History Month, a month-long "Black Lives Matter" art exhibition was organized by three Richmond, Virginia artists at the First Unitarian Universalist Church of Richmond in the Byrd Park area of the city. The show featured more than 30 diverse multicultural artists on a theme exploring racial equality and justice. In the same month Virginia Commonwealth University's James Branch Cabell Library focused on a month-long schedule of events relating to Black history and showed photos from the church's "Black Lives Matter" exhibition on its outdoor screen. The VCU schedule of events also included: the Real Life Film Series The Angry Heart: The Impact of Racism on Heart Disease among African-Americans; Keith Knight presented the 14th Annual VCU Libraries Black History Month lecture; Lawrence Ross, author of the book Blackballed: The Black and White Politics of Race on America's Campuses talked about how his book related to the "Black Lives Matter" movement; and Velma P. Scantlebury, M.D., the first black female transplant surgeon in the United States, discussed "Health Equity in Kidney Transplantation: Experiences from a surgeon's perspective." Black Lives Matter protested the shooting of Jocques Clemmons which occurred in Nashville, Tennessee on February 10, 2017. On May 12, 2017, a day after Glenn Funk, the district attorney of Davidson County decided not to prosecute police officer Joshua Lippert, the Nashville chapter of BLM held a demonstration near the Vanderbilt University campus all the way to the residence of Nashville mayor Megan Barry. On September 27, 2017, at the College of William & Mary, students associated with Black Lives Matter protested an ACLU event because the ACLU had fought for the right of Unite the Right rally to be held in Charlottesville, Virginia. William & Mary's president Taylor Reveley responded with a statement defending the college's commitment to open debate. In February and March, as part of its social justice focus, First Unitarian Universalist Church in Richmond, Virginia presented its Second Annual Black Lives Matter Art Exhibition. Works of art in the exhibition were projected at scheduled hours on the large exterior screen (jumbotron) at Virginia Commonwealth University's Cabell Library. Artists with art in the exhibition were invited to discuss their work in the Black Lives Matter show as it was projected at an evening forum in a small amphitheater at VCU's Hibbs Hall. They were also invited to exhibit afterward at a local showing of the film A Raisin in the Sun. In April 2018, CNN reported that the largest Facebook account claiming to be a part of the "Black Lives Matter" movement was a "scam" tied to a white man in Australia. The account, with 700,000 followers, linked to fundraisers that raised $100,000 or more, purportedly for U.S. Black Lives Matter causes; however, some of the money was instead transferred to Australian banks accounts, according to CNN. Facebook has suspended the offending page. In 2015, after the death of Freddie Gray in Baltimore, Maryland, black activists around the world modeled efforts for reform on Black Lives Matter and the Arab Spring. This international movement has been referred to as the "Black Spring". Connections have also been forged with parallel international efforts such as the Dalit rights movement. Following the death of Ms Dhu in police custody in August 2014, protests often made reference to the BLM movement. In July 2016, a BLM rally was organized in Melbourne, Australia, which 3,500 people attended. The protest also emphasized the issues of mistreatment of Aboriginal Australians by the Australian police and government. In May 2017, Black Lives Matter was awarded the Sydney Peace Prize, which "honours a nominee who has promoted 'peace with justice', human rights and non-violence". In July 2015, BLM protesters shut down Allen Road in Toronto, Ontario, protesting the shooting deaths of two black men in the metropolitan area—Andrew Loku and Jermaine Carby—at the hands of police. In September, BLM activists shut down streets in Toronto, rallied against police brutality, and stood in solidarity with marginalized black lives. Black Lives Matter was a featured part of the Take Back the Night event in Toronto. In June 2016, Black Lives Matter was selected by Pride Toronto as the honoured group in that year's Pride parade, during which they staged a sit-in to block the parade from moving forward for approximately half an hour. They issued a number of demands for Pride to adjust its relationship with LGBTQ people of colour, including stable funding and a suitable venue for the established Blockorama event, improved diversity in the organization's staff and volunteer base, and that Toronto Police officers be banned from marching in the parade in uniform. Pride executive director Mathieu Chantelois signed BLM's statement of demand, but later asserted that he had signed it only to end the sit-in and get the parade moving, and had not agreed to honour the demands. In late August 2016, the Toronto chapter protested outside the Special Investigations Unit in Mississauga in response to the death of Abdirahman Abdi, who died during an arrest in Ottawa. On August 4, 2016, BLM protesters blocked the London Heathrow Airport in London, England. Several demonstrators chained themselves together and lay against the motorway leading to the airport. Ten people were arrested in connection with the incident. There were also BLM-themed protests in other English cities including Birmingham and Nottingham. The UK-held protests marked the fifth anniversary of the shooting death of Mark Duggan. On June 25, 2017, BLM supporters protested in Stratford, London the death of Edson Da Costa, who died in police custody. There were no arrests made at the protest. At the Netroots Nation Conference in July 2015, dozens of Black Lives Matter activists took over the stage at an event featuring Martin O'Malley and Bernie Sanders. Activists, including Black Lives Matter co-founder Patrisse Cullors, asked both candidates for specific policy proposals to address deaths in police custody. The protesters chanted several slogans, including "if I die in police custody, burn everything down". After conference organizers pleaded with the protesters for several minutes, O'Malley responded by pledging to release a wide-ranging plan for criminal justice reform. Protesters later booed O'Malley when he stated "Black lives matter. White lives matter. All lives matter." O'Malley later apologized for his remarks, saying that he did not mean to disrespect the black community. On August 8, 2015, a speech by Democratic presidential candidate and civil rights activist Bernie Sanders was disrupted by a group from the Seattle Chapter of Black Lives Matter including chapter co-founder Marissa Johnson who walked onstage, seized the microphone from him and called his supporters racists and white supremacists. Sanders issued a platform in response. Nikki Stephens, the operator of a Facebook page called "Black Lives Matter: Seattle" issued an apology to Sanders' supporters, claiming these actions did not represent her understanding of BLM. She was then sent messages by members of the Seattle Chapter which she described as threatening, and was forced to change the name of her group to "Black in Seattle". The founders of Black Lives Matter stated that they had not issued an apology. In August 2015, the Democratic National Committee passed a resolution supporting Black Lives Matter. In the first Democratic primary debate, the presidential candidates were asked whether black lives matter or all lives matter. In reply, Bernie Sanders stated, "Black lives matter." Martin O'Malley said, "Black lives matter," and that the "movement is making is a very, very legitimate and serious point, and that is that as a nation we have undervalued the lives of black lives, people of color." In response, Hillary Clinton pushed for criminal justice reform, and said, "We need a new New Deal for communities of color." Jim Webb, on the other hand, replied: "As the president of the United States, every life in this country matters." Hillary Clinton was not directly asked the same question, but was instead asked: "What would you do for African Americans in this country that President Obama couldn't?" Clinton had already met with Black Lives Matter representatives, and emphasized what she described as a more pragmatic approach to enacting change, stating "Look, I don't believe you change hearts. I believe you change laws". Without policy change, she felt "we'll be back here in 10 years having the same conversation." In June 2015, Clinton used the phrase "all lives matter" in a speech about the opportunities of young people of color, prompting backlash that she may misunderstand the message of "Black Lives Matter"
A week after the first Democratic primary debate was held in Las Vegas, BLM launched a petition targeted at the DNC and its chairwoman Debbie Wasserman Schultz demanding more debates, and "specifically for a #BlackLivesMatter themed Presidential debate." The petition received over 10,000 signatures within 24 hours of being launched, and had over 33,000 signatures as of October 27, 2015. The DNC said that it would permit presidential candidates to attend a presidential town hall organized by activists, but that it would not add another debate to its official schedule. In response, the organization released a press statement on its Facebook page stating that "[i]n consultation with our chapters, our communities, allies, and supporters, we remain unequivocal that a Presidential Town Hall with support from the DNC does not sufficiently respond to the concerns raised by our members", continuing to demand a full additional debate. After the first debate, in October 2015, a speech by Hillary Clinton on criminal justice reform and race at Atlanta University Center was interrupted by BLM activists. In February 2016, two Black Lives Matters activists protested at a private fundraiser for Clinton about statements she made in 1996 in which she referred to young people as "super-predators". One of the activists wanted Clinton to apologize for "mass incarceration" in connection with her support for her husband, then-President Bill Clinton's 1994 criminal reform law. Republican candidates have been mostly critical of BLM. In August 2015, Ben Carson, the only African American vying for the Republican nomination for the presidency, called the movement "silly". Carson also said that BLM should care for all black lives, not just a few. In the first Republican presidential debate, which took place in Cleveland, one question referenced Black Lives Matter. In response to the question, Scott Walker advocated for the proper training of law enforcement and blamed the movement for rising anti-police sentiment, while Marco Rubio was the first candidate to publicly sympathize with the movement's point of view. In August 2015, activists chanting "Black Lives Matter" interrupted the Las Vegas rally of Republican presidential candidate Jeb Bush. As Bush exited early, some of his supporters started responding to the protesters by chanting "white lives matter" or "all lives matter". Several conservative pundits have labeled the movement a "hate group". Candidate Chris Christie, the New Jersey Governor, criticized President Obama for supporting BLM, stating that the movement calls for the murder of police officers. Christie's statement was condemned by New Jersey chapters of the NAACP and ACLU. BLM activists also called on the Republican National Committee to have a presidential debate focused on issues of racial justice. The RNC, however, declined to alter their debate schedule, and instead also supported a townhall or forum. In November 2015, a BLM protester was physically assaulted at a Donald Trump rally in Birmingham, Alabama. In response, Trump said, "maybe he should have been roughed up because it was absolutely disgusting what he was doing." Trump had previously threatened to fight any Black Lives Matter protesters if they attempted to speak at one of his events. In March 2016, Black Lives Matter helped organize the 2016 Donald Trump Chicago rally protest that forced Trump to cancel the event. Four individuals were arrested and charged in the incident. Two were "charged with felony aggravated battery to a police officer and resisting arrest", one was "charged with two misdemeanor counts of resisting and obstructing a peace officer", and the fourth "was charged with one misdemeanor count of resisting and obstructing a peace officer". A CBS reporter was one of those arrested outside the rally. He was charged with resisting arrest. A group called Mothers of the Movement, which includes the mothers of Michael Brown, Sandra Bland, Eric Garner, and other mothers whose "unarmed African-American children have been killed by law enforcement or due to gun violence," addressed the 2016 Democratic National Convention on July 26. Commenting on the first of 2016 presidential debates between Hillary Clinton and Donald Trump, some media outlets characterized Clinton's references to implicit bias and systemic racism as speaking "the language of the Black Lives Matter movement," while others pointed out neither Clinton nor Trump used the words "Black Lives Matter." In a Washington Post op-ed, DeRay Mckesson endorsed Hillary Clinton, because her "platform on racial justice is strong". He articulated that voting alone is not the only way to bring about "transformational change". He said that "I voted my entire life, and I was still tear-gassed in the streets of St. Louis and Baltimore. I voted my entire life, and those votes did not convict the killers of Sandra Bland, Freddie Gray or Michael Brown". The phrase "All Lives Matter" sprang up as response to the Black Lives Matter movement, shortly after the movement gained national attention. Several notable individuals have supported All Lives Matter. Its proponents include Senator Tim Scott. NFL cornerback Richard Sherman supports the All Lives Matter message, saying "I stand by what I said that All Lives Matter and that we are human beings." According to an August 2015 telephone poll, 78% of likely American voters said that the statement "all lives matter" was closest to their own personal views when compared to "black lives matter" or neither. Only 11% said that the statement "black lives matter" was closest. Nine percent said that neither statement reflected their own personal point of view. "All Houses Matter", Chainsawsuit, Kris Straub, July 7, 2016. Cartoonist uses a house fire to illustrate why critics see "All Lives Matter" as problematic. According to professor David Theo Goldberg, "All Lives Matter" reflects a view of "racial dismissal, ignoring, and denial". Founders have responded to criticism of the movement's exclusivity, saying, "#BlackLivesMatter doesn't mean your life isn't important – it means that Black lives, which are seen without value within White supremacy, are important to your liberation." President Barack Obama spoke to the debate between Black Lives Matter and All Lives Matter. Obama said, "I think that the reason that the organizers used the phrase Black Lives Matter was not because they were suggesting that no one else's lives matter ... rather what they were suggesting was there is a specific problem that is happening in the African American community that's not happening in other communities." He also said "that is a legitimate issue that we've got to address." Following the shooting of two police officers in Ferguson and in response to BLM, the hashtag #BlueLivesMatter was created by supporters of the police. Following this, Blue Lives Matter became a pro-police officer movement in the United States. It expanded after the killings of American police officers. In response to BLM, Facebook pages emerged purporting to represent "White Student Unions" on college campuses in the United States. The pages often promise a "safe space" for white students and condemn alleged anti-white racism on campus. The New York Times reported in 2015: "Whether the Facebook groups were started by students at the universities or by an outside group seeking to stir up debate is unclear." Representatives of the schools as well as some students have said that the groups do not represent their values. Other students complained that attempts by the universities to remove these pages are a violation of free speech. White Lives Matter is an activist group created in response to Black Lives Matter. In August 2016, the Southern Poverty Law Center added "White Lives Matter" to its list of hate groups. The group has also been active in the United Kingdom. The "White Lives Matter" slogan was chanted by torch-wielding alt-right protestors during the 2017 Unite the Right rally in Charlottesville, Virginia. On October 28, 2017, numerous 'White Lives Matter' rallies broke out in Tennessee. Dominated in Shelbyville particularly, protesters justified their movement in response to the increasing number of immigrants and refugees to Middle Tennessee. Criticism of "Black Lives Matter"
Some black civil rights leaders, such as Rev. Cecil "Chip" Murray, Najee Ali, and Earl Ofari Hutchinson, have criticized the tactics of BLM. Author and minister Barbara Ann Reynolds has criticized the confrontational tactics of BLM. Some critics accuse Black Lives Matter of being anti-police. Sgt. Demetrick Pennie of the Dallas Police Department filed an unsuccessful lawsuit against Black Lives Matter in September 2016, which accused the group of inciting a "race war." Marchers using a BLM banner were recorded in a video chanting, "Pigs in a blanket, fry 'em like bacon" at the Minnesota State Fair. Law enforcement groups said that the chant promotes death to police. The protest organizer disputed that interpretation, saying "What we are promoting is that if black people who kill police officers are going to fry, then we want police officers to face the same treatment that we face as civilians for killing officers." A North Carolina police chief retired after calling BLM a terrorist group. A police officer in Oregon was removed from street duty following a social media post in which he said he would have to "babysit these fools", in reference to a planned BLM event. Deroy Murdock questioned statistics stated by some BLM activists over the rate at which black people are killed by police. Murdock wrote, "the notion that America's cops simply are gunning down innocent black people is one of today's biggest and deadliest lies." Heather Mac Donald says "the Black Lives Matter movement is based on a lie. The idea that the United States is experiencing an epidemic of racially driven police shootings is false—and dangerously so." Citing the Washington Post's database of fatal police shootings, she writes that the police shot 990 people in 2015, most of whom were armed "or violently resisting arrest. ... Whites made up 49.9 percent of those victims, blacks 26 percent. That proportion of black victims is lower than what the black violent crime rate would predict." Sam Dotson, chief of the St. Louis Police Department, coined the term "Ferguson effect" to describe what he believed was a change in enforcement behavior following the shooting of Michael Brown and subsequent unrest. According to Dotson, his officers were less active in enforcing the law because they were afraid they might be charged with breaking the law. FBI Director James Comey suggested that the Black Lives Matter movement is partly leading to a national rise in crime rates because police officers have pulled back from doing their jobs. A study published by the Justice Department, said there was an increase in homicides in 56 large cities over the course of 2015, and examined the "Ferguson effect" as one of three plausible explanations. Other researchers have looked for this "Ferguson effect" in the rise in crime rates and failed to find evidence for it on a national level. A report over the increased homicide rate in St. Louis concluded there was an "absence of credible and comprehensive evidence" for the Ferguson effect being responsible for that city's homicide increase. Seattle Seahawks cornerback Richard Sherman said about the "Black Lives Matter" movement, "I dealt with a best friend getting killed, and it was [by] two 35-year-old black men. There was no police officer involved, there wasn't anybody else involved, and I didn't hear anybody shouting 'black lives matter' then." John McWhorter wrote that the Black Lives Matter movement had "done the nation a service" by bringing national attention to police killings of unarmed African Americans, and he encouraged it to expand its focus to include "black-on-black crime". In response, it has been noted that there are already a number of movements active against violence within the black community. Others have commented that it is reasonable to hold sworn police officers to higher standards than criminals. It has also been pointed out that considerable resources are already deployed to combat violence by civilians (including intraracial violence), with most such acts resulting in efforts to prosecute the perpetrator; in contrast, very few cases of police violence result in criminal accusations, let alone convictions. More broadly, it is claimed that the reference to intraracial violence attempts, in bad faith, to divert attention from the injustice under discussion, an example of whataboutery. Others criticize the term 'black-on-black violence' as it may imply that such violence is due to black race itself, as opposed to various confounding factors, and in reality the proportion of intraracial murders is almost the same among blacks and whites in the US (less than ten percentage points of difference in one-on-one attacks where the races were reported). The Movement for Black Lives, a group affiliated with the Black Lives Matter movement, has been criticized by some Jewish groups and by the Ecumenical Leadership Council of Missouri, an association of hundreds of predominantly African-American churches in Missouri, for its statement regarding Israel. In a platform released in August 2016, the Movement for Black Lives used the word "genocide" to describe Israel's treatment of the Palestinians, described Israel as an "Apartheid state", criticized Israeli settlement building in the Palestinian territories, and called for support for the Boycott, Divestment and Sanctions movement against Israel. However, Rabbi Arthur Waskow wrote that although the platform has "thousands of words that address both comprehensively and in great detail what it would take to fully end the legacy of slavery and the constant resurgence of racism", a single paragraph "and especially one word in it—'genocide'" has grabbed the attention of the American Jewish community. Waskow wrote that the specific allegations in the paragraph concerning "the Israeli government's behavior and its effects in the US are largely accurate BUT—factually, it is not true that the State of Israel has committed, is committing, genocide upon the Palestinian people." He added, "Oppression, yes. Genocide, no." A concert named "Broadway Supports Black Lives Matter", whose proceeds would have gone to BLM, had been scheduled for September 11, 2016, at Feinstein's/54 Below, a Manhattan cabaret. The club's management canceled the event, saying they could not hold the event given the release of a platform by a group affiliated with Black Lives Matter "that accuses Israel of genocide and endorses a range of boycott and sanction actions." Commenting on the platform, Alan Dershowitz wrote, "It is a real tragedy that Black Lives Matter — which has done so much good in raising awareness of police abuses — has now moved away from its central mission and has declared war against the nation state of the Jewish people." He noted that Black Lives Matter is not monolithic and "is a movement comprising numerous groups. ... But the platform is the closest thing to a formal declaration of principles by Black Lives Matter." Dershowitz called on "all decent supporters of Black Lives Matter" to demand removal of the paragraph accusing Israel of genocide. Former New York City Mayor Rudy Giuliani said that Black Lives Matter is "inherently racist" and called the movement anti-American. According to Giuliani, the BLM movement divides people and exacerbates racial tensions. Black Lives Matter co-founder Alicia Garza replied, "What those comments show me is that the former mayor doesn't understand racism," adding that his comments were "not rooted in fact." Washington Post columnist Jonathan Capehart wrote that Giuliani's comments reinforced his sense that the former mayor lives in a "racial world of make-believe". Women from within the Black Lives Matter movement, including professor and civil rights advocate Treva B. Lindsey, have argued that BLM has sidelined black women's experiences in favor of black men's experiences. For example, some argue[who?] that more demonstrations have been organized to protest the killings of Michael Brown and Trayvon Martin than the killings of Kayla Moore or Rekia Boyd. In response, Say Her Name was founded to focus specifically on the killing of black women by police and to bring their names into the Black Lives Matter protest. Their stated goal is to offer a more complete, but not competing, narrative with the overall Black Lives Matter movement. The February 2015 issue of Essence magazine and the cover was devoted to Black Lives Matter. In December 2015, BLM was a contender for the Time magazine Person of the Year award, coming in fourth of the eight candidates. On May 9, 2016, Delrish Moss was sworn in as the first African-American police chief in Ferguson, where he acknowledges he faces such challenges as diversifying the police force, improving community relations, and addressing issues that catalyzed the Black Lives Matter movement. The television drama Scandal depicted Black Lives Matter in its March 5, 2015, episode that showed a police officer shooting an unarmed black teenager. The primetime Fox drama Empire aired season 3 episode 2 on September 28, 2016, which portrays Black Lives Matter and police brutality when Andre Lyon is attacked by police officers for moving boxes outside his home, without any wrongdoing. The ABC sitcom Black-ish featured a debate about Black Lives Matter in the episode "Hope". The U.S. population's perception of Black Lives Matter varies considerably by race. According to a September 2015 poll on race relations, nearly two-thirds of African Americans mostly agree with Black Lives Matter, while 42% of white Americans are unsure or do not have an opinion about Black Lives Matter. Of white people surveyed, 41% thought that Black Lives Matter advocated violence, and 59% of whites thought that Black Lives Matter distracted attention from the real issues of racial discrimination. By comparison, 82% of black people polled thought that Black Lives Matter was a nonviolent movement, and 26% of blacks thought that Black Lives Matter distracted attention from the real issues of racial discrimination. On the question of whether "Black Lives Matter" was mostly a movement or mostly a slogan, 46% of whites and 67% of blacks thought that it is mostly a movement. A similar poll in June 2016 found that 65% of black American adults supported Black Lives Matter and 40% of white American adults support it. Fifty-nine percent of black Americans thought that Black Lives Matter would "be effective, in the long run, in helping blacks achieve equality" and 34% of white Americans thought so. A 2017 Harvard-Harris survey found that 35% of whites and 83% of blacks have a favorable view of the movement. ^ Friedersdorf, Conor. "Distinguishing Between Antifa, ...." The Atlantic. August 31, 2017. August 31, 2017. ^ a b Day, Elizabeth (July 19, 2015). "#BlackLivesMatter: the birth of a new civil rights movement". The Guardian. Retrieved December 18, 2016. ^ Luibrand, Shannon (August 7, 2015). "Black Lives Matter: How the events in Ferguson sparked a movement in America". CBS News. Retrieved December 18, 2016. ^ Eligon, John (November 18, 2015). "One Slogan, Many Methods: Black Lives Matter Enters Politics". The New York Times. Retrieved December 18, 2016. ^ a b c Cullors-Brignac, Patrisse Marie (February 23, 2016). "We didn't start a movement. We started a network". Medium. Retrieved December 18, 2016. ^ Collins, Ben; Mak, Tim (August 15, 2015). "Who Really Runs #BlackLivesMatter?". The Daily Beast. Retrieved December 18, 2016. ^ a b c "PBS NewsHour/Marist Poll Summary of National Findings" (PDF). Marist College Institute for Public Opinion. September 2015. Retrieved July 14, 2016. ^ a b May, Ashley (July 13, 2016). "#AllLivesMatter hashtag is racist, critics say". USA Today. Retrieved July 14, 2016. ^ a b Townes, Carimah. "Obama Explains The Problem With 'All Lives Matter'". think progress. Retrieved August 6, 2016. ^ a b "'Blue Lives Matter' trends after officers shot". BBC. Retrieved July 27, 2015. ^ a b Jennings, Angel. "Longtime L.A. civil rights leaders dismayed by in-your-face tactics of new crop of activists". Los Angeles Times. ^ a b Reynolds, Barbara (August 24, 2015). "I was a civil rights activist in the 1960s. But it's hard for me to get behind Black Lives Matter". The Washington Post. ISSN 0190-8286. Retrieved September 17, 2015. ^ a b c d e f g h Ruffin II, Herbert G. "Black Lives Matter: The Growth of a New Social Justice Movement". BlackPast.org. Retrieved December 18, 2016. ^ Ross, Janell (August 19, 2015). "How Black Lives Matter moved from a hashtag to a real political force". The Washington Post. Retrieved November 19, 2015. ^ Demby, Gene (December 31, 2014). "The Birth of a New Civil Rights Movement". Politico. Retrieved December 18, 2016. ^ Cooper, Brittney (August 26, 2014). "Al Sharpton does not have my ear: Why we need new black leadership now". Salon. Retrieved December 18, 2016. ^ "The Fight for the Soul of the Black Lives Matter Movement". Gothamist. April 7, 2015. Archived from the original on November 8, 2016. Retrieved December 18, 2016. ^ Harris, Frederick C. (Summer 2015). "The Next Civil Rights Movement?". Dissent. Retrieved December 18, 2016. ^ a b Guynn, Jessica (March 4, 2015). "Meet the woman who coined #BlackLivesMatter". USA Today. Retrieved December 18, 2016. ^ Hunt, Jazelle (January 13, 2015). "Black Lives Still Matters to Grassroots and Black Media". Black Voice News. National Newspaper Publishers Association. Retrieved December 18, 2016. ^ Zarya, Valentina (July 19, 2015). "Founders of #BlackLivesMatter: Getting credit for your work matters". Fortune. Retrieved December 18, 2016. ^ Somashekhar, Sandhya (November 17, 2015). "How Black Lives Matter, born on the streets, is rising to power on campus". The Washington Post. Retrieved December 18, 2016. ^ "About the Black Lives Matter Network". Retrieved December 18, 2016. ^ Dalton, Deron (May 4, 2015). "The Three Women Behind The Black Lives Matter Movement". MadameNoire. Retrieved December 18, 2016. ^ Chatelain, Marcia; Asoka, Kaavya (Summer 2015). "Women and Black Lives Matter: An Interview with Marcia Chatelain". Dissent. Retrieved December 18, 2016. ^ Miller, Ryan W. (July 12, 2016). "Black Lives Matter: A primer on what it is and what it stands for". USA Today. Retrieved July 13, 2016. ^ Freelon, Deen; McIlwain, Charlton D.; Clark, Meredith D. (February 29, 2016). "Beyond the Hashtags" (PDF). Center for Media and Social Impact. p. 9. Retrieved December 18, 2016. ^ Fletcher Jr., Bill (September 25, 2015). "From Hashtag to Strategy: The Growing Pains of Black Lives Matter". In These Times. Retrieved July 13, 2016. ^ Cobb, Jelani (March 14, 2016). "The Matter of Black Lives". The New Yorker. Retrieved July 13, 2016. ^ "Black Lives Matter movement 'needed in UK'". BBC News. August 5, 2016. Retrieved December 18, 2016. ^ Segalov, Michael (February 2, 2015). "We Spoke to the Activist Behind #BlackLivesMatter About Racism in Britain and America". Vice. Retrieved December 18, 2016. ^ Wood, Patrick (July 18, 2016). "Black Lives Matter movement striking a chord with Indigenous Australians". ABC News. Retrieved December 18, 2016. ^ Bell, W. Kamau; Kondabolu, Hari (September 7, 2016). "Shaun King on Controversy, Color, and Kaepernick". Politically Re-Active with W. Kamau Bell & Hari Kondabolu. Retrieved December 18, 2016. ^ Collins, Ben (August 15, 2015). "Who Really Runs #BlackLivesMatter?". The Daily Beast. Retrieved July 13, 2016. ^ Bernard, Jephie (April 1, 2016). "Black Lives Matter: the movement, the organization, and how journalists get it wrong". Columbia Journalism Review. Retrieved July 13, 2016. ^ Pearce, Matt (October 20, 2015). "Why the term 'Black Lives Matter' can be so confusing". Los Angeles Times. Retrieved July 13, 2016. ^ "Black Lives Matter: Guiding Principles". Black Lives Matter. Archived from the original on October 4, 2015. Retrieved February 26, 2017. ^ Naasel, Kenrya Rankin (July 20, 2016). "Why It's Dangerous to Lump All Black Activists Under the 'Black Lives Matter' Banner". ColorLines. Retrieved December 18, 2016. ^ "About Us". Movement for Black Lives. Retrieved December 18, 2016. ^ Maloney, Alli (September 29, 2015). "When police turn violent, activists Brittany Packnett and Johnetta Elzie push back". The New York Times. Women in the World. Retrieved December 18, 2016. ^ Eligon, John (November 18, 2015). "One Slogan, Many Methods: Black Lives Matter Enters Politics". The New York Times. Retrieved July 12, 2016. ^ McKitterick, Molly (August 12, 2015). "Frustration Lies Behind 'Black Lives Matter'". VOA. Retrieved December 18, 2016. ^ R.L.G. (January 15, 2015). "Johnson: Words of the year (#BlackLivesMatter)". The Economist. Retrieved December 18, 2016. ^ McCulloch, Gretchen (January 29, 2015). "Is a hashtag a word? The case of #BlackLivesMatter". Slate. Retrieved December 18, 2016. ^ Weedston, Lindsey (December 19, 2014). "12 Hashtags That Changed the World in 2014". Yes! Magazine. Retrieved October 24, 2015. ^ Carty, Victoria (2015). Social Movements and New Technology. Boulder, Colo.: Westview Press. pp. 19–34. ISBN 978-0-8133-4586-4. ^ Jaeger, Kyle (July 18, 2016). "3 Reasons This Anti-Black Lives Matter Meme Is Totally Wrong". attn:. Retrieved December 18, 2016. ^ Wortham, Jenna (September 2016). "Black Tweets Matter". Smithsonian. Retrieved December 18, 2016. ^ Mina, An Xiao (June 30, 2015). "An Activism of Affirmation: On Artists, the Internet, and Social Movements". Walker Art Center. Retrieved December 18, 2016. ^ White, Khadijah (Summer 2016). "Black Lives on Campuses Matter: The Rise of the New Black Student Movement". Soundings (63): 86–97. Retrieved December 18, 2016. ^ a b Tucker, Bryan; Hegg, Stephen (October 22, 2015). "Tactics of Black Lives Matter". IN Close. Episode 216. KCTS-TV. Retrieved December 18, 2016. ^ "'Black Lives Matter' builds power through protest". The Rachel Maddow Show. August 10, 2015. Retrieved December 18, 2016. ^ Gottfried, Mara H.; Eccher, Marino (October 3, 2015). "Black Lives Matter's Twin Cities Marathon protest peaceful". St. Paul Pioneer Press. Retrieved December 18, 2016. ^ "Department of Justice Report Regarding the Criminal Investigation into the Shooting Death of Michael Brown by Ferguson, Missouri Police Officer Darren Wilson" (PDF). U.S. Department of Justice. March 4, 2015. Retrieved December 18, 2016. ^ Kim, Grace Ji-Sun; Jackson, Jesse (December 18, 2014). "'I Can't Breathe': Eric Garner's Last Words Symbolize Our Predicament". HuffPost. Retrieved November 18, 2015. ^ Zimmer, Ben (December 15, 2014). "The Linguistic Power of the Protest Phrase 'I Can't Breathe'". Wired. Retrieved November 18, 2015. ^ Phillip, Abby (December 11, 2014). "Protesting racial injustice while white". The Washington Post. Retrieved November 18, 2015. ^ Ford, Glen (November 10, 2015). "Tamir Rice and the Meaning of 'No Justice – No Peace'". Black Agenda Report. Retrieved November 18, 2015. ^ Palmer, Nathan (August 19, 2015). "'No Justice, No Peace': Black Lives Matter & Bernie Sanders". Sociology in Focus. Retrieved November 18, 2015. ^ Fretland, Katie; Connolly, Daniel (July 8, 2016). "Protest against police violence, vigil for reconciliation held in Memphis". The Commercial Appeal. Retrieved July 11, 2016. ^ Williamson, Vanessa; Trump, Kris-Stella; Einstein, Katherine Levine (2018). "Black Lives Matter: Evidence that Police-Caused Deaths Predict Protest Activity". Perspectives on Politics. 16 (2): 400–415. doi:10.1017/S1537592717004273. ISSN 1537-5927. ^ Harris, Aisha (August 3, 2015). "Has Kendrick Lamar Recorded the New Black National Anthem?". Slate. Retrieved May 6, 2016. ^ Workneh, Lilly (May 16, 2016). "Jesse Williams Wants You To 'Stay Woke' In New Film On Black Lives Matter". HuffPost. Retrieved December 18, 2016. ^ Akindele, Toni (May 16, 2016). "Jesse Williams Chronicles 'Black Lives Matter' Movement in Powerful Documentary". Essence. Retrieved December 18, 2016. ^ a b Williams, Yohuru (April 29, 2015). "You're Nobody 'Till Somebody Kills You: Baltimore, Freddie Gray and the Problem of History". HuffPost. Retrieved December 21, 2016. ^ Solomon, Akiba (September 5, 2014). "Get on the Bus: Inside the Black Lives Matter 'Freedom Ride' to Ferguson". ColorLines. Retrieved December 21, 2016. ^ Moore, Darnell L.; Cullors, Patrisse (September 4, 2014). "5 ways to never forget Ferguson – and deliver real justice for Michael Brown". The Guardian. Retrieved December 21, 2016. ^ Thrasher, Steven W. (March 13, 2015). "What next for Black Lives Matter in Ferguson after city's police shooting?". The Guardian. Retrieved December 21, 2016. ^ Grad, Shelby (October 20, 2015). "How Black Lives Matter became a thorn in the side of L.A. leaders". Los Angeles Times. Retrieved December 21, 2016. ^ Prupis, Nadia (February 10, 2015). "NYPD Officer Indicted in Shooting of Akai Gurley: Reports". Common Dreams. Retrieved December 21, 2016. ^ Serna, Josef (November 28, 2014). "Bay Area train service restored after Ferguson protest shutdown". Los Angeles Times. Retrieved July 7, 2016. ^ "14 Ferguson Activists Arrested After Demonstration Shuts Down Transbay BART". CBS San Francisco. November 28, 2014. Retrieved December 21, 2016. ^ Fields, Liz (April 10, 2015). "After Walter Scott Killing, Black Lives Matter Movement Calls For Citizen Oversight of Police". Vice News. Retrieved December 21, 2016. 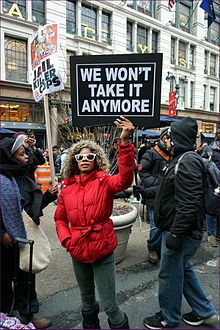 ^ "Activists Blast NYPD Attempts to Silence Movement for Change". Black Lives Matter. December 23, 2014. Archived from the original on December 26, 2014. Retrieved December 21, 2016. ^ Reinan, John (July 4, 2015). "Black Lives Matter protesters question 'intertwined' relationship between Mall of America and Bloomington". Star Tribune. Retrieved December 21, 2016. ^ Brumfield, Ben (December 21, 2014). "Protesters' chants of 'Black Lives Matter' echo at megamall; at least 20 arrested". CNN. Retrieved December 21, 2014. ^ Seigle, Max (December 14, 2014). "Many participate in 'Black Lives Matter' rally downtown". WISN-TV. Retrieved December 21, 2016. ^ Wallace, Lewis (March 30, 2015). "Dayton 'Black Lives Matter' protesters to appear in court today". WKSU. Retrieved December 21, 2016. ^ Anderson, Michelle D. (December 13, 2014). "Muskegon-area churches to participate in 'Black Lives Matter' movement on Sunday". Muskegon Chronicle. Retrieved December 21, 2016. ^ Skinner, Curtis (November 24, 2015). "Black Lives Matter protesters sue over treatment by California police". Yahoo! News. Reuters. Retrieved December 21, 2016. ^ Wisniewski, Mary (March 24, 2015). "Three arrested as Chicago protesters demand police reforms". Reuters. Retrieved November 9, 2015. ^ Rocha, Veronica. "LAPD arrests 14 protesters after #BlackLivesMatter demonstration". Los Angeles Times. Retrieved July 23, 2016. ^ Hagen, Sarah. "Peaceful 'Black Lives Matter' protest in Tampa". 10 News. Retrieved November 8, 2015. ^ Norfleet, Nicole. "Twin Cities students walk out of schools to join Black Lives Matter protest". Star Tribune. Retrieved November 8, 2015. ^ Fields, Liz. "After Walter Scott Killing, Black Lives Matter Movement Calls For Citizen Oversight of Police". Vice News. Retrieved May 26, 2015. ^ Mandaro, Laura; Guynn, Jessica. "Naked protesters gather in San Francisco for 'Black Lives Matter'". USA Today. Retrieved May 26, 2015. ^ Ellis, Ralph; McLaughlin, Elliott (May 25, 2015). "Cleveland protesters appear in court". CNN. Retrieved May 26, 2015. ^ Spicuzza, Mary; Glauber, Bill. "Madison DA decides no charges warranted in Robinson shooting". Milwaukee Journal Sentinel. Retrieved May 26, 2015. ^ "Black Lives Matter: Charleston Shooting Was an Act of Terror". TeleSUR. June 20, 2015. Retrieved June 28, 2015. ^ Zukic, Rialda. "Hundreds march in solidarity in Charleston after church shooting". PBS Newshour. Retrieved October 31, 2015. ^ Kettmann, Kayla. "UC Berkeley's Black Student Union holds vigil, protest for Charleston victims". Daily Californian. dailycal.org. ^ "Organizers says 20,000 joined Bridge to Peace march on Ravenel Bridge". abcnews4.com. Retrieved November 2, 2015. ^ "ROBERT E. LEE MONUMENT IN VA. VANDALIZED WITH 'BLACK LIVES MATTER'". ABC 7. Retrieved November 2, 2015. ^ "'Black Lives Matter' spray painted on New Orleans monument". Fox 8. Retrieved November 2, 2015. ^ "McKinney video: Protest over Texas pool party policing". BBC News. Retrieved November 8, 2015. ^ Rhodes, Dawn. "More Sandra Bland footage released; protest held in downtown Chicago". Chicago Tribune. Retrieved November 1, 2015. ^ "Groups in Texas hold vigil, protest in jail death of Sandra Bland". Toronto Sun. Retrieved November 1, 2015. ^ Fuller, Courtis. "Black Lives Matter stages rally after murder indictment against UC officer". wlwt.com. Retrieved November 1, 2015. ^ "United States: Thousands march against racism, police brutality in New Jersey". Green Left Weekly. August 7, 2015. Retrieved December 15, 2016. ^ Chin, Alan. "Another reason to question whether black lives matter in Mississippi". Reuters. Retrieved July 23, 2016. ^ Dodrill, Tara. "Mississippi Town Protests Death of Black Man by White Cop". Inquisitir. Retrieved July 23, 2016. ^ Stein, Perry. "Black Lives Matter organizers hold rally in D.C. for black trans women". The Washington Post. Retrieved November 1, 2015. ^ "2 arrested after Kerrick trial protests take violent turn". wcnc.com. Retrieved November 1, 2015. ^ Chang, David. "Janelle Monae, Jidenna March Through Philly". NBC Philadelphia. Retrieved November 1, 2015. ^ "Ferguson protesters, police gather on West Florissant Avenue; state of emergency declared in county". St. Louis Post-Dispatch. Retrieved November 1, 2015. ^ Wilson, Simone. "Hundreds of #BlackLivesMatter Protesters March on Downtown Brooklyn". patch.com. Retrieved November 1, 2015. ^ Baddour, Dylan. "Black Lives Matter protest shut down by police in Austin, Texas". Houston Chronicle. Retrieved November 1, 2015. ^ Hedgpeth, Dana. 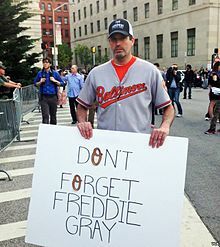 "Views from Baltimore as protesters rally in Freddie Gray case". The Washington Post. Retrieved November 1, 2015. ^ Pedroncelli, Rich. "Black Lives Matter protesters rally to back Senate bill increasing police oversight". ocregister.com. Associated Press. Retrieved November 1, 2015. ^ Jaeger, Kyle (September 24, 2015). "Jeremy McDole Was Shot and Killed by Delaware Police". Attn:. ^ Walk-Morris, Tatiana. "Black Lives Matter activists arrested during protest of police chiefs conference". Chicago Reader. Retrieved October 28, 2015. ^ Shaker, Nadeen. ""This injustice has taken genocidal proportions": Why Cornel West and Carl Dix are rising up against police brutality". Salon. Retrieved October 31, 2015. ^ "Voices of Rise Up October: Quentin Tarantino, Cornel West, Victims' Families Decry Police Violence". Democracy Now. Retrieved October 31, 2015. ^ "51 arrested in protests after black man shot by Minneapolis police". USA Today. Retrieved November 18, 2015. ^ Forliti, Amy (November 19, 2015). "Minneapolis police, protesters clash at 4th Precinct". Saint Paul Pioneer Press. Saint Paul. Retrieved July 11, 2016. ^ Keller, Bill (November 24, 2015). "SUV rams 4th Precinct gate, 2 arrested for Jamar Clark vandalism". Fox 9 News. Minneapolis. Retrieved July 11, 2016. ^ Smith, Mary Ann (November 24, 2015). "Five people were shot near Black Lives Matter protest site". The Minneapolis Star Tribune. Minneapolis. Retrieved July 11, 2016. ^ Smith, Mary Lynn (November 24, 2015). "Five people were shot near Black Lives Matter protest site". Star Tribune. Minneapolis. Retrieved July 11, 2016. ^ Silverstein, Jason (November 24, 2015). "Five people shot at Minneapolis Black Lives Matter protest". Daily News. New York. Retrieved December 21, 2015. ^ "Two men arrested in shooting of Black Lives Matter protesters in Minneapolis". The Washington Post. November 24, 2015. Retrieved December 21, 2015. ^ Jany, Libor; Chanen, David (November 25, 2015). "3 men in custody, 1 released in Minneapolis 4th Precinct protest shooting". Star Tribune. Retrieved July 11, 2016. ^ "Minnesota Man Gets 15 Years for Shooting 5 Black Lives Matter Protesters". CBS News. April 27, 2017. Retrieved April 30, 2017. ^ Helm, Angela (April 29, 2017). "Man Gets 15 Years for Shooting 5 BLM Activists Protesting Police Shooting Death of Jamar Clark". The Root. Retrieved April 30, 2017. ^ Lopez, German. "The Chicago police shooting of Laquan McDonald, explained". Vox. Retrieved July 23, 2016. ^ O, Janet (January 30, 2016). "HUNDREDS MARCH IN SF TO PROTEST SFPD'S FATAL SHOOTING OF MARIO WOODS". ABC7. Retrieved July 10, 2016. ^ Saxon-Parrish, Shani (January 15, 2016). "The Movement for Black Lives Is Urging You to #ReclaimMLK This Weekend". Colorlines. Retrieved July 23, 2016. ^ Alberty, Erin; Michael McFall (March 2, 2016). "Police investigate SLC shooting; protesters flood downtown streets (video)". Salt Lake Tribune. Retrieved July 23, 2016. ^ Pena, Marina (June 7, 2016). "Hundreds protest sentencing of Black Lives Matter activist in Pasadena". Pasadena Star News. Retrieved July 23, 2016. ^ Brennan, Christopher (July 5, 2016). "Alton Sterling shot, killed by Louisiana cops during struggle after he was selling music outside Baton Rouge store". Daily News. New York. Retrieved July 5, 2016. ^ Jacobo, Julia (July 6, 2016). "Baton Rouge Police Shooting: Alton Sterling's Aunt Says She Wants 'Justice' at Vigil". ABC News. Retrieved July 9, 2016. ^ Chappell, Bill (July 7, 2016). "Police Stop Ends in Black Man's Death; Aftermath Is Live-Streamed on Facebook". NPR. Retrieved July 7, 2016. ^ "Philando Castile death: Aftermath of police shooting streamed live". BBC News. July 7, 2016. Retrieved July 7, 2016. ^ Pheifer, Pat; Peck, Claude (July 7, 2016). "Aftermath of fatal Falcon Heights officer-involved shooting captured on video". Star Tribune. Retrieved July 7, 2016. ^ Sanburn, Josh (July 10, 2016). "Black Lives Matter Leader Condemns Violence at St. Paul Protest". Time. Retrieved July 23, 2016. ^ Bromwich, Patrick Mcgee, Manny Fernandez, Jonah Engel; Pérez-peña, Richard (July 8, 2016). "Dallas Shooting Suspect, Micah Johnson, 'Upset at White People'". The New York Times. ISSN 0362-4331. Retrieved July 9, 2016. ^ Mekelburg, Madlin (July 8, 2016). "Dan Patrick Blames Black Lives Matter Movement for Dallas Shooting". The Texas Tribune. Retrieved July 9, 2016. ^ "Texas Lt. Gov. Patrick on Dallas ambush: 'This has to end'". Fox News Channel. July 8, 2016. Retrieved July 9, 2016. 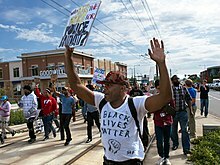 ^ "Black Lives Matter condemns Dallas, pushes forward with protests". CBS News. July 8, 2016. Retrieved July 9, 2016. ^ "The Black Lives Matter Network advocates for dignity, justice, and respectBlack Lives Matter". blacklivesmatter.com. Archived from the original on July 9, 2016. Retrieved July 9, 2016. ^ Bruton, F. Brinley; Chirbas, Kurt; The Associated Press (July 9, 2016). "More Than 100 Arrested at Baton Rouge, Rochester Black Lives Matter Protests". NBC News. Retrieved July 14, 2016. After more than 100 people were arrested in a flurry of nationwide protests Friday night, police departments were preparing for another round of demonstrations Saturday demanding justice after the shootings this week of black men by cops. ^ Lee, Jasmine C., Iaryna Mykhyalshyn, Rudy Omri and Anjali Singhvi, "At Least 88 Cities Have Had Protests in the Past 13 Days Over Police Killings of Blacks". The New York Times. July 16, 2016. ^ Harrison, Lily (July 13, 2016). "LeBron James, Carmelo Anthony, Chris Paul and Dwyane Wade Open 2016 ESPYs With Powerful Black Lives Matter Message". E!. Retrieved July 27, 2016. ^ Ricke, Claire (July 26, 2016). "Black Lives Matter marks anniversary of Larry Jackson, Jr.'s death". KXAN. Retrieved December 7, 2016. ^ Nitkn, Alex. "Hundreds Block Downtown Streets To Protest Police Killing Of Paul O'Neal". DNA Info. Archived from the original on September 23, 2016. Retrieved September 23, 2016. ^ Lartey, Jamiles (August 2, 2016). "Black woman shot dead by police during alleged standoff while holding son". The Guardian. ^ Campbell, Colin. "Maryland FOP conference opens to protests in Baltimore". The Baltimore Sun. August 15, 2016. ^ Morrow, Christian (July 28, 2016). "Black Lives Matter rally highlights Kelley Jr. shooting". Pittsburgh Courier. Retrieved November 2, 2016. ^ Sandritter, Mark. "A timeline of Colin Kaepernick's national anthem protest and the NFL players who joined him". SB Nation. Retrieved September 20, 2016. ^ Wyche, Steve (August 27, 2016). "Colin Kaepernick explains why he sat during national anthem". National Football League. Retrieved August 27, 2016. ^ Allen, Nick (September 18, 2016). "Colin Kaepernick: NFL Black Lives Matter protests recall rebellious spirit of 1960s sporting greats". The Daily Telegraph. Retrieved October 4, 2016. ^ Katch, Danny; Zirin, Dave (September 25, 2016). "From the Raised Fist to the Bended Knee | Jacobin". Jacobin. Retrieved October 4, 2016. ^ Johnson, Jason (August 29, 2016). "Colin Kaepernick Shows #BlackLivesMatter Even When His Career May Not". theroot.com. Retrieved October 4, 2016. ^ "Charlotte police shooting: Protests erupt after officer kills man". ^ "Protests erupt after fatal officer-involved shooting in NE Charlotte". ^ Salinger, Tobias (September 19, 2016). "Video released in fatal police shooting of unarmed Oklahoma man Terence Crutcher (WARNING - GRAPHIC)". Daily News. New York. Retrieved September 19, 2016. ^ Marusak, Joe; Ely Portillo; Mark Price; Adam Bell (September 20, 2016). "Charlotte faces aftermath of protests ignited by fatal police shooting; 16 officers injured". The Charlotte Observer. ^ Chokshi, Niraj; Bromwich, Jonah Engel (September 28, 2016). "Demonstrators Protest Fatal Police Shooting of a Black Man in El Cajon, Calif". The New York Times. Retrieved December 24, 2016. ^ Tometi, Opal; Lipscombe, Carl (October 18, 2016). "What the Shooting of Alfred Olango Says About the State of Black Refugees in the U.S." Time. Retrieved December 24, 2016. ^ "Black History Month at VCU aims to spark dialogue, celebrate black excellence". ^ Sawyer, Ariana; Tamburin, Adam; Wadhwani, Anita (May 11, 2017). "Jocques Clemmons' family, community leaders call for officer's firing". The Tennessean. Retrieved May 14, 2017. ^ Sawyer, Ariana Maia (May 12, 2017). "Justice for Jocques Coalition demonstrates outside Nashville mayor's home". The Tennessean. Retrieved May 14, 2017. ^ "Silent march for Jocques Clemmons ends at Nashville mayor's home". WKRN-TV. May 12, 2017. Retrieved May 14, 2017. ^ Wright, Wesley (October 6, 2017). "William and Mary students protest ACLU speaker, white supremacy". The Virginia Gazette. Retrieved October 21, 2017. ^ Bauer-Wolf, Jeremy (October 5, 2017). "ACLU Speaker Shouted Down at William & Mary". Inside Higher Ed. Retrieved October 8, 2017. ^ Bauer-Wolf, Jeremy (October 6, 2017). "Free speech advocate silenced". Inside Higher Ed. Retrieved October 21, 2017. ^ 1000 Blanton Ave., Richmond Museum District Va; location!, Be the first to review this. "Second Annual Black Lives Matter Art Show". Style Weekly. Retrieved March 5, 2018. ^ O'Sullivan, Donie (2018). "The biggest Black Lives Matter page on Facebook is fake". CNNMoney. Retrieved April 10, 2018. ^ McGowan, Michael (April 10, 2018). "Fake Black Lives Matter Facebook page run by Australian union official – report". The Guardian. Retrieved April 10, 2018. ^ "Australian union official linked to fake Black Lives Matter page suspended". ABC News (Australia). April 10, 2018. Retrieved April 10, 2018. ^ McKenzie, Sheena. "Black Lives Matter protests spread to Europe". CNN. Retrieved August 7, 2016. ^ Beydoun, Khaled. "Baltimore and the emergence of a Black Spring". Al Jazeera. Retrieved November 11, 2015. ^ Khan, Janaya. "Black Lives Matter Has Become a Global Movement". Common Dreams. Retrieved November 11, 2015. ^ Paul, Sonia (November 8, 2015). "From Black Lives Matter, activists for India's discriminated Dalits learn tactics to press for dignity". Public Radio International. Retrieved November 18, 2015. ^ Klippmark, Pauline; Crawley, Karen (October 16, 2017). "Justice for Ms Dhu: Accounting for Indigenous Deaths in Custody in Australia". Social & Legal Studies: 1–21. doi:10.1177/0964663917734415. ^ Blue, Ethan (September 27, 2016). "Seeing Ms. Dhu: inquest, conquest, and (in)visibility in black women's deaths in custody". Settler Colonial Studies. 7 (3): 299–320. doi:10.1080/2201473X.2016.1229294. ^ "#BlackLivesMatter hits Australia". Australian Broadcasting Corporation. July 17, 2016. ^ Wahlquist, Calla (May 22, 2017). "Black Lives Matter awarded 2017 Sydney peace prize". The Guardian. ISSN 0261-3077. Retrieved May 23, 2017. ^ Miller, Adam. "Black Lives Matter protesters shut down section of Allen Expressway". globalnews.ca. Global News. Retrieved November 1, 2015. ^ Donato, Al. "Black Lives Matter Takes Back The Night And Shuts Down Downtown Toronto". Huff Post. Retrieved October 31, 2015. ^ "Black Lives Matter versus Pride Toronto". Now, July 12, 2016. ^ Goffin, Peter (September 20, 2016). "An Apologetic Pride Toronto gets rejected". Retrieved September 20, 2016. ^ "Pride organizer says he has not agreed to exclude police floats from parade". CP24, July 4, 2016. ^ "Black Lives Matter protesters hit SIU headquarters". Toronto Star. August 24, 2016. ^ "Black Lives Matter protesters close London City Airport runway". BBC News. September 6, 2016. Retrieved January 28, 2017. ^ Weaver, Matthew; Grierson, Jamie (September 6, 2016). "Black Lives Matter protest stops flights at London City airport". The Guardian. ISSN 0261-3077. Retrieved January 28, 2017. ^ McKenzie, Sheena (August 5, 2016). "Black Lives Matter blocks London's Heathrow Airport". CNN. ^ Parker, Fiona (June 25, 2017). "Riot police deployed to 'Justice for Edson' protest as fires started". Metro. Retrieved June 29, 2017. ^ "Demonstrators confront police in east London over Da Costa death". The Guardian. June 26, 2017. Retrieved June 29, 2017. ^ Resnikoff, Ned (July 8, 2015). "Black Lives Matter disrupts Martin O'Malley, Bernie Sanders event". Retrieved July 2, 2016. ^ a b Moody, Chris (July 19, 2015). "Democrats lose control of presidential event". CNN. Retrieved August 12, 2015. ^ "Protesters drove Bernie Sanders from one Seattle stage. At his next stop, 15,000 people showed". The Washington Post. ^ "Who Really Runs #BlackLivesMatter?". The Daily Beast. ^ Bernie Sanders Interrupted at Seattle Rally by Black Lives Matter Protesters. August 8, 2015 – via YouTube. ^ Brunner, Jim. "Black Lives Matter protesters shut down Bernie Sanders; later rally draws 15,000". The Seattle Times. Retrieved August 9, 2015. ^ Ollstein, Alice Miranda (August 10, 2015). "Bernie Sanders' New Racial Justice Platform Wins Praise From Black Lives Matter Activists". Think Progress. Retrieved October 26, 2016. ^ Lewis, Renee. "Black Lives Matter dismisses criticism over Sanders disruption". Al Jazeera. Retrieved August 12, 2015. ^ Seitz-Wald, Alex. "DNC passes resolution supporting Black Lives Matter". MSNBC. Retrieved November 1, 2015. ^ a b c Flores, Reena. "Democratic debate: Do black lives matter?". CBS News. Retrieved October 31, 2015. ^ Townes, Carimah. "How The Democratic Presidential Candidates Responded To The Black Lives Matter Question". Think Progress. Retrieved October 31, 2015. ^ Vega, Tanzina. "Did Hillary and Bernie connect with black voters?". CNN. Retrieved October 31, 2015. ^ Resnick, Gideon. "Everyone but Jim Webb Says Black Lives Matter". The Daily Beast. Retrieved October 31, 2015. ^ "Hillary Clinton's brutal frankness to Black Lives Matter reveals her approach to politics". Vox. Retrieved October 2, 2015. ^ "Hillary Clinton's 3-Word Misstep: 'All Lives Matter'". NPR. Retrieved February 16, 2016. ^ Rappeport, Alan (June 24, 2016). "Hillary Clinton's 'All Lives Matter' Remark Stirs Backlash". The New York Times. Retrieved October 25, 2016. ^ "The #BlackLivesMatter Network Urges the Democratic National Committee to host a #BlackLivesMatter Themed Presidential Debate" (Press release). #BlackLivesMatter Organization. October 20, 2015. Retrieved December 23, 2015. ^ "We Demand a Black Lives Matter Presidential Debate". salsa4.salsalabs.com. Retrieved October 31, 2015. ^ a b "Press statement on DNC response". facebook.com/BlackLivesMatter (Press release). Black Lives Matter network. Retrieved October 31, 2015. ^ "Mobile Uploads - Black Lives Matter | Facebook". www.facebook.com/BlackLivesMatter. Retrieved October 31, 2015. ^ a b Lowery, Wesley (October 21, 2015). "DNC and RNC won't add a debate, but give their blessings to Black Lives Matter presidential town hall". The Washington Post. ISSN 0190-8286. Retrieved October 31, 2015. ^ Merica, Dan. "Hillary Clinton protested by Black Lives Matter". CNN. Retrieved October 31, 2015. ^ Scott, Eugene (February 25, 2016). "Black Lives Matter protesters confront Clinton at a fundraiser". CNN. Retrieved October 21, 2016. ^ Lerner, Kira (August 1, 2015). "Ben Carson Says The 'Black Lives Matter' Movement Is 'Silly'". Think Progress. Retrieved October 26, 2016. ^ Williams, Vanessa. "Carson: Activists should advocate for 'all black lives, not just a few'". The Washington Post. Retrieved November 26, 2015. ^ a b Ollstein, Alice. "GOP Debate Spends Less Than A Minute On Police Violence And Black Lives Matter". Think Progress. Retrieved October 31, 2015. ^ "Scott Walker suggested it's more dangerous to be a cop today. It's actually much safer". Vox. Retrieved October 2, 2015. ^ "Marco Rubio shows other Republicans how to respond to Black Lives Matter". Vox. Retrieved October 2, 2015. ^ Frasier, Jordan. "'Black Lives Matter' Activists Interrupt Jeb Bush Rally". NBC News. Retrieved August 13, 2015. ^ O'Keefe, Ed. "'Black Lives Matter' activists, Jeb Bush meet face-to-face". The Washington Post. Retrieved August 13, 2015. ^ "Here Are The Conservative Pundits Branding Black Lives Matter A 'Hate Group'". Retrieved September 16, 2015. ^ Miller, Jake. "Why did Chris Christie go after Black Lives Matter?". CBS News. Retrieved October 30, 2015. ^ Brodesser-Akner, Claude. "Christie's Black Lives 'murder' comments bashed by NAACP, ACLU". The Star-Ledger. Retrieved October 31, 2015. ^ Geraghty, Jim. "Black Lives Matter Makes a Good Case for Hosting a Democratic Debate". National Review. Retrieved October 31, 2015. ^ Diamond, Jeremy. "Trump on protester: 'Maybe he should have been roughed up'". CNN. Retrieved November 26, 2015. ^ Legum, Judd (August 11, 2015). "Trump Vows To Beat Up Black Lives Matter Protesters If They Try To Speak At His Campaign Events". ThinkProgress. Retrieved October 26, 2016. ^ Linthicum, Kate (March 12, 2016). "How black, Latino and Muslim college students organized to stop Trump's rally in Chicago". Los Angeles Times. Retrieved March 13, 2016. ^ Cassidy, John (March 13, 2016). "The Chicago Anti-Trump Protest Was Only the Beginning". The New Yorker. ^ Rhodes, Wawn (March 13, 2016). "4 charged in clashes after canceled Trump rally at UIC". Chicago Tribune. Retrieved March 14, 2016. ^ Calderon, Michael (March 13, 2016). "CBS News Reporter Sopan Deb Arrested While Covering Donald Trump Rally". HuffPost. Retrieved March 14, 2016. ^ CNN, Eric Bradner and Eugene Scott. "'Mothers of the Movement' makes case for Hillary Clinton". CNN. Retrieved July 29, 2016. ^ "Gun Violence and Police Victims' Mothers to Speak at DNC". ABC News. July 27, 2016. Retrieved July 29, 2016. ^ Lopez, German (July 27, 2016). "This moment at the DNC shows Democrats have embraced Black Lives Matter". Vox. Retrieved July 29, 2016. ^ Stockman, Farah (September 29, 2016). "The Subtle Phrases Hillary Clinton Uses to Sway Black Voters". The New York Times. Retrieved October 2, 2016. ^ Karni, Annie (October 1, 2016). "Hillary's high stakes mission to Charlotte". Politico. Retrieved October 2, 2016. ^ Racine, Hope (September 2016). "The #BlackLivesMatter Discussion At The First Debate Omitted 3 Crucial Words". Bustle. Retrieved October 2, 2016. ^ "DeRay Mckesson: Why I'm voting for Hillary Clinton". ^ "Black Lives Matter activist DeRay Mckesson endorses Hillary Clinton". ^ Chan, J. Clara (July 13, 2016). "What Is 'All Lives Matter'? A Short Explainer". Retrieved October 18, 2016. ^ Scott, Eugene (September 3, 2015). "Tim Scott defends use of 'all lives matter'". CNN. Retrieved October 24, 2015. ^ Samuel, Ebenezer. "Seahawks cornerback Richard Sherman explains why he stands by that All Lives Matter". Daily News. New York. Retrieved August 6, 2016. ^ "Black Lives Matter Or All Lives Matter?". Rasmussen Reports. August 20, 2015. Retrieved July 14, 2016. ^ Goldberg, David Theo (September 25, 2015). "Why 'Black Lives Matter' Because All Lives Don't Matter in America". HuffPost. Retrieved November 18, 2015. ^ "A Herstory of the #BlackLivesMatter Movement by Alicia Garza – The Feminist Wire". thefeministwire.com. Retrieved October 2, 2015. ^ "President Obama defends Black Lives Matter movement". CBS News. Retrieved October 24, 2015. ^ Lennard, Natasha (July 8, 2016). "After Dallas, We Don't Need to Say 'Blue Lives Matter'". Rolling Stone. ^ a b Turner, Taylor. "Facebook Pages Purporting To Represent 'White Student Unions' Spark Backlash On College Campuses". ABC. Retrieved November 26, 2015. ^ Victor, Daniel (November 24, 2015). "'White Student Union' Groups Set Off Concerns at Campuses". The New York Times. Retrieved October 2, 2016. ^ "White Lives Matter declared a hate group by extremist monitor". RT. August 30, 2016. Retrieved September 15, 2016. ^ Stack, Liam (August 30, 2016). "White Lives Matter Has Been Declared a Hate Group". The New York Times. Retrieved September 1, 2016. ^ Mettler, Katie (August 31, 2016). "Why SPLC says White Lives Matter is a hate group but Black Lives Matter is not". The Washington Post. Retrieved September 1, 2016. ^ "First UK 'White Lives Matter' Margate March Sees Tiny Turnout #WLM". HuffPost. October 22, 2016. Retrieved October 23, 2016. ^ Stanglin and Ingersoll, Doug and Stephanie (October 28, 2017). "'White Lives Matter' rallies: Opponents outnumber white nationalists at Tennessee shout fests". USA Today. Retrieved March 10, 2018. ^ Mendoza, Jessica. "Can Black Lives Matter and Police Lives Matter coexist? (+video)". The Christian Science Monitor. ISSN 0882-7729. Retrieved September 17, 2015. ^ Andrews, Travis M. (September 21, 2016). "Black Dallas police officer sues Black Lives Matter on behalf of 'Christians, Jews and Caucasians,' others". The Washington Post. ^ Kunzelman, Michael (June 14, 2017). "Can Black Lives Matter be sued? Activist's attorney says no". Associated Press. ^ Gottfried, Mara H. (August 31, 2015). "Black Lives Matter chant threatening to officers, police say". TwinCities.com, St. Paul Pioneer Press. Retrieved September 22, 2015. ^ "NC police chief who retired after calling 'Black Lives Matter' a 'terrorist group' speaks out". Fox. Retrieved November 7, 2015. ^ Larimer, Sarah. "Officer reassigned after calling Black Lives Matter protesters 'fools' in tweet". The Washington Post. Retrieved November 26, 2015. ^ Mac Donald, Heather (September 7, 2016). "The lies told by the Black Lives Matter movement". New York Post. Retrieved June 21, 2017. ^ Gold, Ashley (June 5, 2015). "Why has the murder rate in some US cities suddenly spiked?". BBC News. Retrieved September 12, 2016. ^ Mathis, Joel. "Is the Black Lives Matter movement inspiring a new crime wave?". Newsday. Retrieved October 30, 2015. ^ "Murder Rate Spike Could Be 'Ferguson Effect,' DOJ Study Says". NPR. June 15, 2016. ^ "Is the 'Ferguson effect' real? Researcher has second thoughts". The Guardian. May 13, 2016. ^ Schuppe, Jon (November 27, 2015). "Researchers Cast Doubt on 'Ferguson Effect' as Cause of Crime Spikes". NBC News. Retrieved December 15, 2015. ^ Gold, Ashley (June 5, 2015). "Why has the murder rate in some US cities suddenly spiked?". BBC News. Retrieved December 15, 2015. ^ Rosenfeld, Richard (June 2015). "Was There a 'Ferguson Effect' on Crime in St. Louis?" (PDF). Sentencing Project. Retrieved December 15, 2015. ^ Cohen, Stephen (September 16, 2015). "Seattle Seahawks' Richard Sherman addresses 'Black Lives Matter' after post falsely attributed to him". Seattle Post-Intelligencer. Hearst Seattle Media. Retrieved September 17, 2015. ^ McWhorter, John. "Commentary: Black Lives Matter should also take on black-on-black crime". Chicago Tribune. Retrieved October 28, 2015. ^ a b Harriot, Michael. "Why We Never Talk About Black-on-Black Crime: An Answer to White America's Most Pressing Question". The Root. Retrieved January 12, 2018. ^ Lartey, Jamiles. "'Demolish that lie': James Forman Jr takes on Black Lives Matter backlash". The Guardian. Retrieved January 12, 2018. ^ Hafner, Josh. "Why Black Lives Matter doesn't focus on 'black-on-black' crime". USA Today. Retrieved January 12, 2018. ^ Yun Tan, Zhai. "What does 'black-on-black crime' actually mean?". The Christian Science Monitor. Retrieved January 12, 2018. ^ Cortellessa, Eric (August 3, 2016). "In platform, Black Lives Matter accuses Israel of 'genocide,' backs BDS". The Times of Israel. Retrieved August 13, 2016. ^ Rosenberg, Yair (August 5, 2016). "From Left to Right, Jewish Groups Condemn 'Repellent' Black Lives Matter Claim of Israeli 'Genocide'". Tablet. Retrieved August 13, 2016. ^ The Forward; Kestenbaum, Sam (August 5, 2016). "Jewish Groups Condemn Black Lives Matter Platform for Accusing 'Apartheid' Israel of 'Genocide'". Haaretz. Retrieved August 13, 2016. ^ Wooten, Lawrence M. (August 14, 2016). "Letter to the Editor: Churches reject Black Lives Matter's platform on Israel". St. Louis Post-Dispatch. Retrieved September 10, 2016. ^ "Black church group in Missouri condemns Black Lives Matter statement on Israel". Jewish Telegraphic Agency. August 15, 2016. Retrieved September 10, 2016. ^ Waskow, Arthur (August 9, 2016). "'Genocide,' Torah, & 'Black Lives Matter'". The Shalom Center. Retrieved August 13, 2016. ^ Paulson, Michael (September 8, 2016). "Black Lives Matter Benefit Is Canceled Over Stand on Israel". The New York Times. Retrieved September 12, 2016. ^ "Broadway Supports Black Lives Matter Concert Canceled | Playbill". Playbill. Retrieved September 13, 2016. ^ Dershowitz, Alan (August 12, 2016). "Alan Dershowitz: Black Lives Matter must rescind anti-Israel declaration - The Boston Globe". Boston Globe. Retrieved January 11, 2017. ^ "Rudy Giuliani: "Black lives matter" is racist, anti-American". CBS News. Retrieved August 5, 2016. ^ Lim, Naomi (July 11, 2016). "Rudy Giuliani: Black Lives Matter 'inherently racist'". CNN. Retrieved October 26, 2016. ^ Capehart, Jonathan (July 13, 2016). "No, 'Black Lives Matter' is not 'inherently racist'". The Washington Post. Retrieved October 29, 2016. ^ Lindsey, Treva B. (2015). "Post-Ferguson: A 'Herstorical' Approach to Black Violability". Feminist Studies. 41 (1): 232–237. doi:10.15767/feministstudies.41.1.232. ^ Editor, Lilly Workneh Black Voices; Post, The Huffington (May 21, 2015). "#SayHerName: Black Women And Girls Matter, Too". HuffPost. Retrieved November 24, 2016. ^ "Say Her Name: Resisting Police Brutality against Black Women" (PDF). African American Policy Forum (AAPF). ^ Callahan, Yesha. "Essence Dedicates February Cover to #BlackLivesMatter". The Root. Archived from the original on December 24, 2015. Retrieved November 11, 2015. ^ Botelho, Greg; Tim Hume (December 9, 2015). "TIME names German leader Angela Merkel its Person of the Year". CNN. Retrieved December 9, 2015. ^ New Ferguson Police Chief Sworn In, The New York Times, May 9, 2016. ^ Garza, Alicia. "A Herstory of the #BlackLivesMatter Movement". The Feminist Wire. Retrieved March 8, 2015. ^ Ajayi, Luvvie. "Scandal Recap: Justice for Brandon". Vulture. Retrieved October 31, 2015. ^ Wagmeister, Elizabeth (September 29, 2016). "'Empire' Tackles Black Lives Matter, Police Brutality". Variety. Retrieved October 27, 2016. ^ Robinson, Joanna. "How Black-ish's Searing Political Commentary Transcended "Very Special Episode" Territory". HWD. Retrieved October 27, 2016. ^ Rankin, Kenrya (September 22, 2015). "Poll Reveals that White America Views Black Lives Matter Movement as a Distraction". ColorLines. Retrieved July 14, 2016. ^ Rankin, Kenrya (June 28, 2016). "You'll Never Guess How Many White People Say They Support #BlackLivesMatter". ColorLines. Retrieved July 14, 2016. ^ "On Views of Race and Inequality, Blacks and Whites Are Worlds Apart". Pew Research Center. June 27, 2016. Retrieved July 14, 2016. ^ Easley, Jonathan (August 2, 2017). "Poll: 57 percent have negative view of Black Lives Matter movement". The Hill. Retrieved August 18, 2017. Cobb, Jelani (March 14, 2016). "The Matter of Black Lives". The New Yorker. Cole, Teju (July 26, 2016). "The Superhero Photographs of the Black Lives Matter Movement". The New York Times Magazine. Lebron, Christopher J. 2017. The Making of Black Lives Matter: A Brief History of An Idea. Oxford University Press. Miller, Lisa L. (August 5, 2016). "Black Activists Don't Ignore Crime". The New York Times. Stephen, Bijan (November 2015). "Social Media Helps Black Lives Matter Fight the Power". Wired. Stevens, Melissa (July 28, 2016). "I'm a GOP Delegate and I Wore a 'Black Lives Matter' Shirt to the RNC". Time. Bernard, Marie Lyn (2014). "#BlackLivesMatter: A Longform Reading List". Autostraddle. USA. Cheng, Selina (July 2016). "The complete summer reading syllabus on Black Lives Matter". Quartz. Teller, Malcolm (July 2016). "Black Lives Matter Reference Guide" – via Medium. Wikimedia Commons has media related to Black Lives Matter.